Scott Maxwell added another victory to his resumé when he, along with David Brabham and Sebastien Bourdais, brought the Multimatic Team Panoz home first in GT2 at Sebring – writes Gary Horrocks. This victory, combined with class victories at Le Mans, Petit Le Mans and also Daytona, gives him class victories in all of the modern classic endurance races. While overall victories are great, for this year, all concentration is on winning the season championship in GT2. “An overall win some time would be nice, but I sure won’t complain. I’ve had some good results at some pretty important races, but winning here at Sebring was a great start for the season. David and I are concentrating on the season Championship and were realistically looking to get points here at Sebring, but to win, getting the maximum points is fantastic. All told, the #50 Multimatic Team Panoz Esperante led the GT2 class for 178 of the 320 laps ran, accounting for seven hours and 22 minutes of the 12 hour race. “Through the entire race, we were working hard to stay up front. The competition was real tough. I expect the Ferrari to be right there all season long. But our car was good and it looks like the Pirelli tires have closed the gap on our competitors. We had two compounds for the race and only once did I have a problem with them. 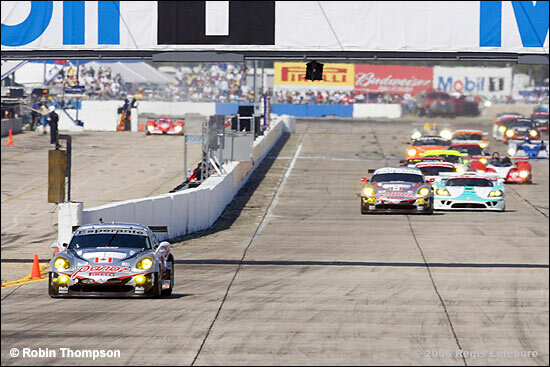 We waited one stint too many before swapping over to the night-time tires, so I was running the day tires at dusk, when it was hard to generate any heat into them.” It appears that in the cooler hours of darkness, the performance of the Pirelli tires may have contributed to the speed advantage the Panoz had late in the race. While the tires were working well, late into the race, it was then that Scott started to experience some vibrations in the drivetrain. It was so bad that he almost came into the pits to have it checked out, but he was talked out of it by Larry Holt, who knew that an unscheduled stop at that time could put an end to their chances for victory. While the drivers felt a vibration through the gearbox, especially Sebastien Bourdais, who drove the final stint and was actually concerned if they would make it to the finish, it was not the gearbox itself that was giving the problems. The actual problem was reported to be somewhere else in the drivetrain.